Last edited by faaip on Sun Aug 05, 2018 3:21 pm, edited 1 time in total. I rarely post but I do a lot of MOT Forum stalking (the threads not the members). Really excited for the new season, eternal optimist - for which supporting Leeds is a real challenge. Like Faiip I think MB may be slower to introduce the new signings (bar Douglas) as they familiarise with his tactics. I'm also not convinced Jansson will be fully match fit, although I hope so. It will be interesting to see who makes the bench. I think Clarke, Shackleton and Edmondson were impressive in pre-season, however - Blackman, Baker, Dallas, Berardi/Jansson, Alisoki/Harrison, Roofe/Bamford - are all more likely candidates. None of you have included Tyler Roberts, even on the bench. Am I missing something, he's not injured again is he? I think you are spot with what the starting line up will be 1964white, with Baker starting instead of Forshaw if he's injured. Completely forgot about Tyler Roberts... I suppose that's easily done considering his Leeds career so far. Don't think he'll start though. Also assuming Forshaw is injured. So two from your original bench don't get a shirt - which two? Trying to pick Sunday's 18 make you realize that the squad is still actually quite big. 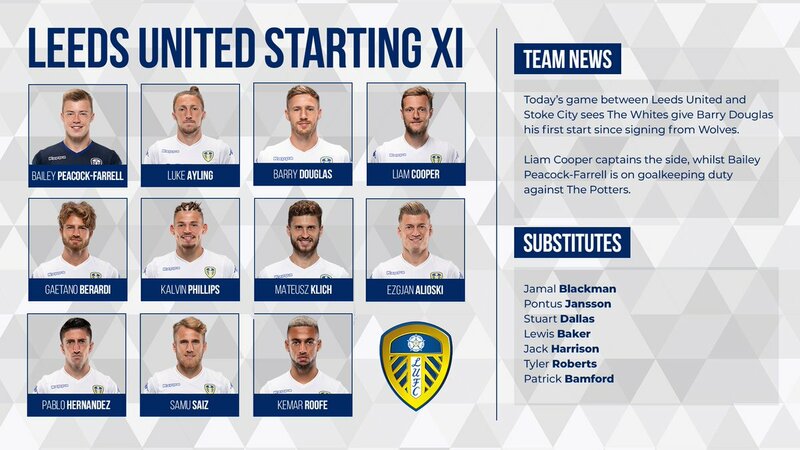 edit - I forgot Alioski and Roofe.....not in starting XI though. Last edited by NorfolkWhite on Thu Aug 02, 2018 3:08 pm, edited 1 time in total. Klich for Forshaw in both if he's injured. . . . . . . . . .Blackman . . . . . . . . .
. . .Jansson. .Phillips . .Coops .
. . . . . . . . . Bamford . . . . . . . . Worst case scenario is the new lads and Jansson arent match fit. Then we get an even more shite defence of Berardi, Cooper and Philips, my absolute nightmare. Dallas at left back, hate inverted full backs. Roofe being bullied by Shawcross all game up front. Saiz running into blind alleys and Pablo desperately trying to keep up with James McLean on the right. Basically last seasons side plus Klich, doesnt bare thinking about. edit - I forgot Alioski.....not in starting XI though. Forshaw out for 6-8 weeks. Opportunity for Klich to show what he can do competitively/over a longer period.